Travel & Leisure magazine did a recent feature on the top 25 donuts (doughnuts?) in the country and number eleven came from Kane's Donuts in Saugus. And now I want to go there. Sure, a plain, glazed donut is pretty standard, but Kane’s does it so well. Show up early to get it fresh and hot out of the fryer; the donut will melt in your mouth. From the outside, this shop looks like a house, but inside, it’s a cozy diner full of history: Kane’s has been serving the same donuts to this community just north of Boston for 55 years. While the flavors are pretty basic, the dough is rolled out and each donut cut by hand, helping give them that extra something. Be warned: if you show up after 10 a.m. on a weekend morning, prepare for slim pickings. Back in college (before any Krispy Kremes opened in the Boston area) my friends and I once drove all the way to NYC just for glazed donuts. We bought two or three dozen then turned right back around and drove back to Boston - eating half of them on the return trip in the car. I could go for a glazed donut right about now. Click (here) for the original blurb. 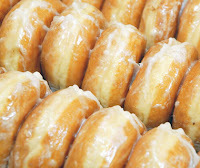 0 Response to "Travel & Leisure Loves Kane's Donuts"
Boarding Pass Bonanza - TODAY! Congrats to MIT Professor Diamond! Ringling Bros. Pachyderm Parade - TODAY! College Night 2010 @ The Aquarium -TONIGHT!